The full Salzburg set list: 01.Pictures Of Home 02. Things I Never Said 03. Into The Fire 04. Strange Kind Of Woman 05. Rapture Of The Deep 06. Fireball 07. Wrong Man 08. Steve's solo - Well Dressed Guitar 09. Kiss Tomorrow Goodbye 10. When A Blind Man Cries 11. Lazy 12. Don's solo - Perfect Strangers 13. Space Truckin´ 14. Highway Star 15. Smoke On The Water 16. Hush - including a very short drum solo 17. Roger's solo - Black Night. October 8th 2006. Cez Arena, Ostrava, Czech Rep.
"A surprisingly good show, however the expectations were rather low after short phone reports of the show the day before (Ostrava). Although Warsaw was not sold out, the band were in good mood and enjoying a very positive and enthusiastic response from the audience. Ian Gillan was in fine form and didin`t use his lyric cribsheet. The set: Pictures Of Home / Things I Never Said / Into The Fire / Strange Kind Of Woman / Rapture Of The Deep / Fireball / Wrong Man / Well Dressed Guitar / When A Blind Man Cries / Lazy / Perfect Strangers / Space Truckin´ / Highway Star / Smoke On The Water and the encore: Hush and Black Night. 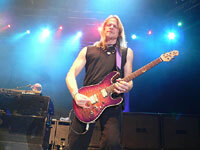 "Oh, what a night… my third Deep Purple show… the other two being in Brazil. 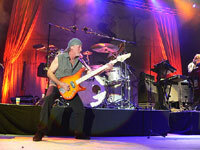 I was in the front row; watching Roger Glover playing up close was amazing… he was perfect (as always). The worst part for me was in Perfect Strangers, when my girlfriend felt unwell and was taken away by the security. On the bright side, she returned during the next song, Space Truckin’, she returned, and in the mean time I'd managed to grab one of the Roger’s custom plectrums… great souvenir! "I don't speak English very well, so I can't write you a review, but it was a great show, as was Lille." Set List: 01. Pictures Of Home / 02. Things I Never Said / 03. Into The Fire / 04. Strange Kind Of Woman / 05. Rapture Of The Deep / 06. Fireball / 07. Wrong Man / 08. Steve's solo / 09. Well Dressed Guitar / 10. When A Blind Man Cries / 11. Lazy / 12. Don's solo / 13. Kiss Tomorrow Goodbye / 14. Perfect Strangers / 15. Space Truckin' / 16. Highway Star / 17. Smoke On The Water / 18. Speed King Medley / 19. Roger's solo / 20. Black Night. "Dates for a Deep Purple French tour in 2007, as seen on a flyer at the Amneville show: 16/03 Reims / 17/03 Tours / 19/03 Nantes / 20/03 Rouen / 22/03 La Rochelle / 23/03 Pau / 25/03 Strasbourg / 26/03 Beauvais / 28/03 Bordeaux / 29/03 St Etienne / 30/03 Grenoble / 31/03 Limoges." Mathieu Pinard. photos: Arnaud Delrot. Set list: 1.Pictures of Home, 2.Things I Never Said, 3. Into The Fire, 4. Strange Kind Of Woman, 5. Rapture Of The Deep, 6. Fireball, 7. Wrong Man, 8. guitar solo + Well Dressed Guitar, 9. When A Blind Man Cries, 10. Lazy, 11. Kiss Tomorrow Goodbye, 12. organ solo ~ 13. Perfect Strangers, 14. Space Truckin', 15. Highway Star, 16. Smoke On The Water. Encore : 1. Hush + drum solo, 2. bass solo + Black Night. "Deep Purple in Nice was quite an event, as in this part of France, hard rock is generally not many people's "cup of tea". 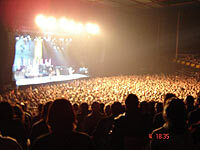 The show took place at the Palais Nikaia, the newest venue in Nice, which can accomodate up to 50,000 according to the type of band performing there (the Stones concert took place there last summer). 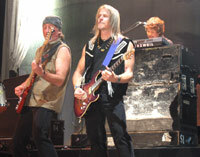 In the case of Deep Purple, the venue was configured to hold 5,000 to 6,000. The venue was almost full. The sound was very good. 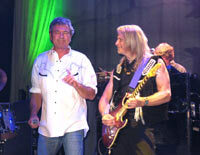 Ian Gillan's voice needed some improvement in the beginning but got better and better during the first three songs. He seemed to be in very good form, and even congratulated a woman in the crowd for her "air-bags"! Some highlights of the show : "Into the Fire" and "Fireball", both of which I heard live for the first time. This was a pure pleasure despite some vocal problems during the former. 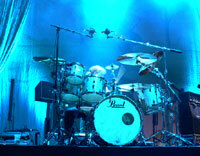 We were glad to see a little drum solo back in the set as we didn't have one when we saw them in Monte Carlo in July. Ian Paice is still the best drummer in the world! They left the stage after almost two hours, throwing picks and drum sticks to an ecstatic crowd. As a conclusion: Hats off ! Excellent show, excellent band. The only "negative" opinion that I would like to express concerns the set list - come on guys, surprise us a little bit more ! "